1. Introduction: Need for meshless methods? The typical Finite Element Method has been used with success in the industry as well as research for many years. However, there are certain situations where the mesh-based approach is not optimal. For example, simulations where the model undertakes large deformations are hard to deal with a mesh-based approach as the mesh becomes severely distorted leading to high inaccuracies and most likely termination of the simulation. One strategy to overcome this problem is remeshing, which means that the mesh is to be recreated during the simulation. However this approach is costly, often difficult to implement in 3D, and prone to errors as the simulation progresses. Overcoming of the typical FE discretization disadvantages naturally led to the idea of mesh free methods where the domain is no longer to discretized using elements, but instead a set of data points – “nodes” – are used. Meshless methods are useful for a diversity of applications, but usually come with an increase in computational time required to run the simulations. Liu  addressed the needs for mesh free methods, which include the handling of large deformations problems, the avoiding of stability issues, the representation of continuous variable fields and fluid representation and its interaction with structures. Some of these methods are the Element Free Galerkin (EFG), Finite Point Method, Point interpolation method, Boundary node method, SPH, etcetera. Due to the particle-like representation, these methods are usually Lagrangian as the material moves along with the nodes. The following gallery showcases some examples coupling SPH to shell elements in LS-DYNA (click on the gallery to see the animated results). The examples and input decks are available in the following link: http://www.dynaexamples.com/sph and belong to LSTC. Impact of an idealized bird (SPH) against a turbine blade (lagrangian shells). Impact of two equivalent bars against a shell structure. The left bar is discretized using Lagrangian solid elements, the right one is discretized using SPH method. Impact of a ball against an aluminium sieve. The Smoothed Particle Hydrodynamics (SPH) is a numerical scheme used for solving partial differential equations; originally developed for simulation of astrophysical problems [2; 3]. It was later modified and extended to solid and fluid dynamics problems . It is a meshless Lagrangian method which makes use of interpolation to compute smooth field variables. In the Finite Element Analysis the domain is discretized into elements whereas with SPH the domain is divided into particles, which are assigned mass, position and velocity, avoiding the classical problems associated with the mesh grid such as mesh distortion for large deflection problems. However, the use of this scheme also implies some disadvantages as zero energy modes, lack of consistency and tensor instability and the modelling of boundary conditions . The aim of the following sections is to provide a basic understanding of the SPH methodology and cover the basic formulation and parameters required to run this numerical scheme. First of all, a different formulation had to be derived for the SPH, rather than the one used for typical FEA. In order to interpolate field variables, instead of a grid and shape functions, a kernel interpolation is used. The value of a function f(x), at an x location, is represented by an integral form of the product of the function and a weighting factor known as the kernel function W(x-x^’,h) . The brackets 〈 〉 symbolize a kernel approximation, h is the so-called smoothing length parameter which defines the domain of the kernel by determining the area of influence of the smoothing function, x’ is the new independent variable and Ω is the domain of the problem. A better understanding may be acknowledged by looking at the following figure where the kernel function is used to approximate a field variable of a particle i within a radius κh, where κ is a constant applied to the smoothing length. Domain and kernel function for a particle i . Various options exist to define the kernel function; the most famous ones are the Gaussian and the polynomial splines. Where the parameter r=(x-x^’)/h is a parameter which makes de domain of the function non-dimensional and d is the number of dimension of the problem (1D, 2D, 3D). This kernel and its derivatives are smooth and stable even for a distorted particle distribution . This spline is used for its narrower support. The B-spline is zero for ranges beyond the kernel domain whereas the Gaussian kernel tends to zero but it is not exactly equal to zero, increasing with the radius of support. However, due to the piecewise definition of the B-spline is less smooth and stable . According to the LS-DYNA theory manual  the kernel function implemented in their code is the B-spline. A comparison between these two kernel functions is presented in the following figure. Kernel functions scaled over the non-dimensional domain r.
The value of the filed function for a particle i is the addition of the contribution of its neighbouring particles j within the interpolation range κh, commonly 2h. The term m_j/ρ_j is the volume associated to each particle j. It is important to notice that contrary to the shape functions in FE the value of the function at a node/particle i is not its nodal value, it is the contribution of a sum of particles within its neighbouring domain. and r_ij is the distance between i-j particles. 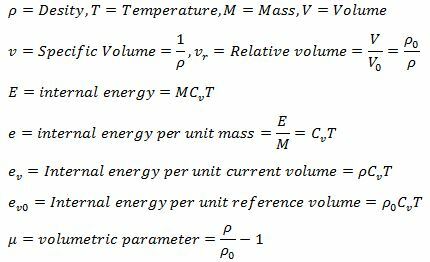 Once the basic formulation has been covered it can be applied to obtain the conservation equations which govern the particle motion and its thermodynamic state. A detailed calculation of the derivation process was carried out by Prof. Vignjevic  through the use of the kernel previously properties and other mathematical theorems. The final discretized conservation equations are shown below. Where σ_j^αβ are the components α and β of the stress at a particle j. It is also worth to mention that acceleration vectors, such as gravity, may be summed to the total momentum. Artificial viscosity is also commonly used to improve the numerical stability of the scheme. Note that the momentum equation may be written in different forms depending on the approximation of choice. E.g In LS-DYNA  the following approximations are available: default formulation (0), renormalization approximation (1), symmetric formulation (2), symmetric renormalized approximation (3), tensor formulation (4), fluid particle approximation (5), or fluid particle with renormalization approximation (6). The renormalized approximation refers to a normalized kernel used in order to achieve 1st order consistency. The fluid approximation notorably used to represent fluid behaviour is shown as follows. Linear polynomial EoS Where C_i are user defined constants depending on the material. Where, the new parameters are defined as follows. C is the speed of sound in the material, S_1,S_2 and S_3 are coefficients of the slope u_s – u_p, γ_0 is a Gruneisen parameter and a is the first order volume correction to γ_0. Where K_0 is the bulk modulus and K_0′ is its first derivative with respect to the pressure. Where e_V is the natural logarithm of the relative volume, C (Pa) is a constant and γ is the adiabatic index. Introducing up to 10 points, the pressure can be then tabulated and extrapolated if needed. Where HMIN and HMAX are constants applied to the initial smoothing length (h_0) and CLSH is a constant. All these constants can typically be modified. Global computation: every particle is mutually checked with the rest globally. This can lead to a very time-consuming algorithm and it is not recommended for large problems. Bucket sort: A grid of size κh is generated and each particle is assigned to one of the boxes, then the searching for each particle starts checking other particles within its own and neighbouring boxes as illustrated below. Bucket sort based algorithm . 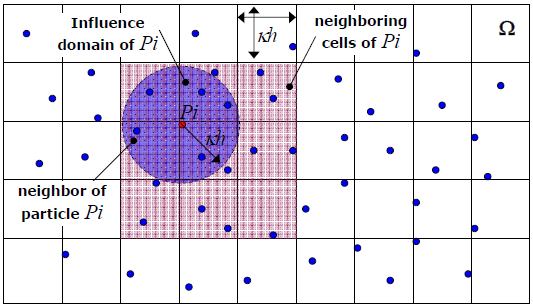 Boundary force method: fixed particles are distributed along the boundaries introducing a force to the inner particles as a function of the distance to the boundary . Ghost particles – Symmetry planes: a symmetry plane is created and the real particles are mirrored into ghost particles which have the same mass, pressure and velocity as the real ones. This effectively creates a symmetry condition. Symmetry plane boundary condition in SPH modelling . Semi-analytical approaches: there are many semi-analytical approaches covered in the literature. For example Prof. Manenti  describes the following where the boundary conditions are approximated through analytical integration terms. Solid boundaries are placed as fluid but unlike the ghost particle method these are an infinite number, producing a continuous boundary. Contact handling in SPH has been ignored and dealt over the years through the conservation equations implied by the SPH formulation. However, this leads to some penetration when SPH particles from different components interact . A literature survey about this topic reveals some unique SPH contact handling algorithm such as  and . 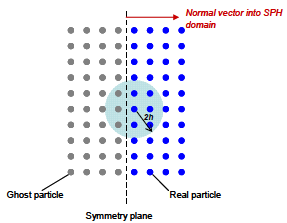 The particle to particle contact is commonly used instead of the particle to surface contact due to the difficulties defining a 3D surface out of SPH particles. Nevertheless, nodes-to-surface contacts have been widely used for SPH – FE coupling. The set of SPH nodes is defined as a slave while the FE master surface is defined as a master. A slave node is simply a nodal point, a SPH particle, whereas a surface is defined using the side of a finite element on the FE component global surface . The most common approach to model contact is the penalty-based method, when a penetration occurs, node-to-node or node-to-surface, a force proportional to the penetration depth is applied to resist and eliminate penetration. Example: LS-DYNA solves the SPH-FE coupling with a nodes-to-surface penalty based contact, where each SPH slave node is checked for penetration against the master FE surface. There are many forms of SPH time stepping schemes, all of them explicit schemes such as leap-frog, predictor-corrector method and the low order Runge-Kutta. They have been employed efficiently throughout the years . Where C_CFL is a constant and h_i, c_i, v_i are the smoothing length, the adiabatic speed of sound and velocity for a particle i. Note that when SPH and FE elements coexist for fluid-structure interaction problems, the time-step can be governed by the SPH rather than the FE. This is for example the case when rigid elements are used to describe the structure. 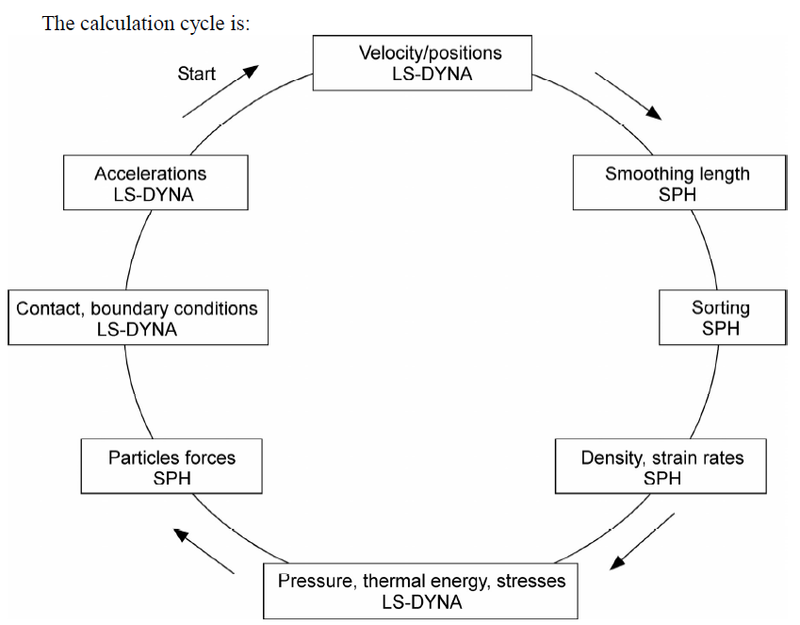 SPH calculation cycle for each time step in LS-DYNA software . The SPH continuous formulation shows to be inconsistent in its domain, 2h, due to the incompleteness of its kernel support. While in its discrete form, if the particles have an irregular distribution, it loses its 0th order consistency. Different SPH distribution types as illustrated in the LS-DYNA manual . The grid must be as regular as possible and without large variations in order to avoid 0th order inconsistency, Mesh 1 above would be preferable to a non-uniform Mesh 2. 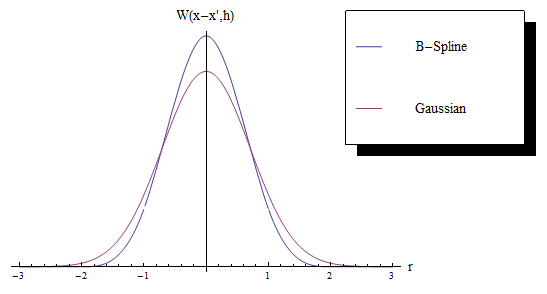 1st order consistency may be achieved by a kernel normalisation (CNSPH) leading to a different kernel and conservation equations approximation previously mentioned. Swegle et al. 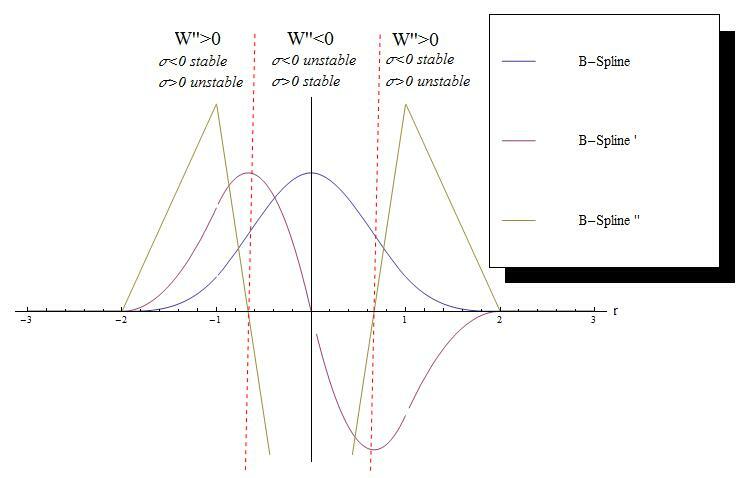 provided a stability criterion for SPH equations, unstable growth occurs when this condition is reached: Where W^” (x-x’,h) is the second kernel derivative and σ is the stress (σ>0 means tension and σ<0 means compression). This instability arises due to numerical issues from the interaction of the kernel interpolation and constitutive equations changing the nature of the partial differential equations. This results in a clustering of SPH particles which often manifests itself as a tensile mode but it is not restricted to it . Swegle et al. stability regions for the cubic B-spline kernel. Spurious modes, known as zero energy modes, are often found in the FEM and it is not a self-unique feature. They are also present in particle methods such as SPH. There are certain situations when non-physical nodal displacement patterns produce zero strain energy. The main cause being that the field variables and their derivatives are calculated at the particle locations, which for certain field combinations may lead to zero field gradients when interpolated, making these modes easily excitable. Some solutions and further explanation and literature are covered by Prof. Vignjevic . Mesh-free methods were developed due to inherent problems of the mesh-based approach discretization. SPH can be used to model large deformations avoiding instabilities and extending the simulation time. On the other hand, SPH has limitations of its own such as significant simulation storage and elapsed time consumption. SPH also presents some formulation shortcomings. SPH adds a whole new set of variables to the simulation. And hence, a proper understanding of these variables is needed to be reckoned by the analyst. Field functions are interpolated among the domain where the smoothing length plays a critical role. There are different formulations according to the implementation of the momentum equation. Boundary conditions are treated differently rather than the usual FE boundary conditions. Contact algorithms between FE-SPH are a key feature for fluid-structure interaction and may be modelled in different ways. A surface-to-nodes contact algorithm is widely used in this regard. Liu, G. R. (2003), Mesh free methods: moving beyond the finite element method, 1st ed, CRC Press LLC, Washington D.C.
 Lucy, L. B. (1977), “A numerical approach to the testing of the fission hypothesis”, The astronomical journal, vol. 82, no. 12, pp. 1013-1024. Monaghan, J. J. (1982), “Why particle methods work”, SIAM J. SCI. STAT. COMPUT., vol. 3, no. 4, pp. 422-433. Monaghan, J. J. (1992), “Smoothed Particle Hydrodynamics”, Annual Review of Astronomy and Astrophysics, vol. 30, pp. 543-574. Vignjevic, R., ( 2010), Review of Development of the Smooth Particle Hydrodynamics (SPH) Method, School of Engineering, Cranfield University. Monaghan, J. J. (1988), “An introduction to SPH”, Computer Physics Communications, vol. 48, no. 1, pp. 89-96. Manenti, S., ( 2009), A Smoothed Particle Hydrodynamics: Basics and Applications, Lecture notes ed., Dipartimento di Meccanica Strutturale, Università degli Studi di Pavia. Livermore Software Technology Corporation (LSTC) (2006), LS-DYNA Theory manual, Livermore, California. Livermore Software Technology Corporation (LSTC) (2007), LS-DYNA Keyword user’s manual (v. 971), Livermore, California. 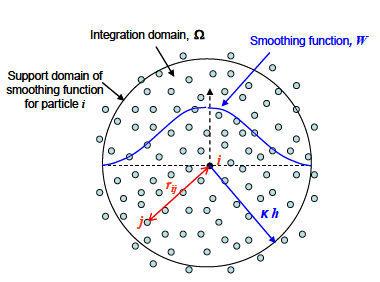 Campbell, J., Vignjevic, R. and Libersky, L. (2000), “A contact algorithm for smoothed particle hydrodynamics”, Computer Methods in Applied Mechanics and Engineering, vol. 184, no. 1, pp. 49-65. Monaghan, J. J. (1989), “On the problem of penetration in particle methods”, Journal of Computational Physics, vol. 82, no. 1, pp. 1-15. Attaway, S. W., Heinstein, M. W. and Swegle, J. W. (1994), “Coupling of smooth particle hydrodynamics with the finite element method”, Nuclear Engineering and Design, vol. 150, no. 2–3, pp. 199-205. Swegle, J. W., Hicks, D. L. and Attaway, S. W. (1995), “Smoothed Particle Hydrodynamics Stability Analysis”, Journal of Computational Physics, vol. 116, no. 1, pp. 123-134.